At the World Ag Expo this week, CLAAS of America is showcasing its SILAGE TECH™ package, a recently released precision performance bundle for the JAGUAR 900 Series forage harvester that increases data information and feed quality. CLAAS forage quality experts are highlighting the technology at the company’s booth at the World Ag Expo in Tulare. 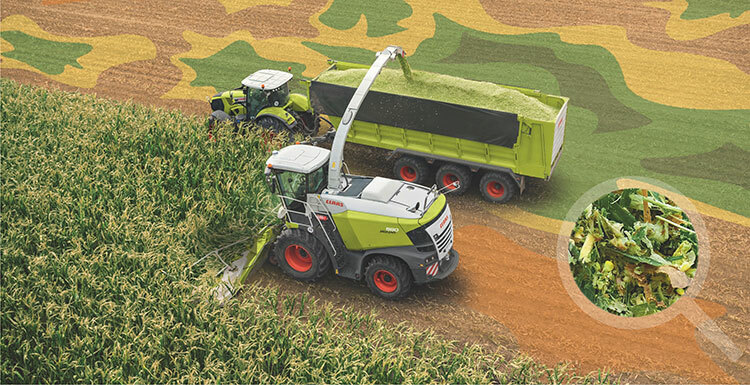 The SILAGE TECH™ package for the JAGUAR 900 Series forage harvester is a combination of on-board components, all connected to the operator’s preferred system for GPS mapping and steering. It includes a QUANTIMETER yield sensor to generate yield maps and control inoculant used, automatic chop length to adjust the length of the silage based on moisture, and a highly accurate near-infrared (NIR) moisture sensor. CLAAS recognized that while kernel processing was certainly an important factor for quality silage, so too was stalk processing. Only CLAAS forage harvesters can be equipped with a patented SHREDLAGE® processor designed to work with longer-chopped silage (20–31 mm). The unique roll design rips and shreds the stalk while crushing the kernel to produce a corn silage with significantly improved bacterial fermenting during ensiling and greater digestion in the cow’s rumen. Because SHREDLAGE silage is easier to digest, both milk production and the health of the herd are improved. University of Wisconsin trials showed that SHREDLAGE dramatically increased the physical effectiveness of corn silage, resulting in an increase of 2.4 pounds per cow in daily milk yield. A recent University of Nebraska–Lincoln study shows that beef cattle fed rations containing SHREDLAGE had greater final body weight, average daily gain, and feed-to-gain ratios than cattle fed conventionally chopped and processed corn silage. CLAAS of America is featuring SILAGE TECH, SHREDLAGE and other product updates at the 2019 World Ag Expo. For more information on any of the above new products and/or updates, please visit the website at www.claas.com or ask your local dealer.